Ottawa Fury FC are unbeaten this Fall NASL season. With an astonishing 19 points from 7 games (2.71 PPG! ), they also top the the combined table for the year. The team to beat. 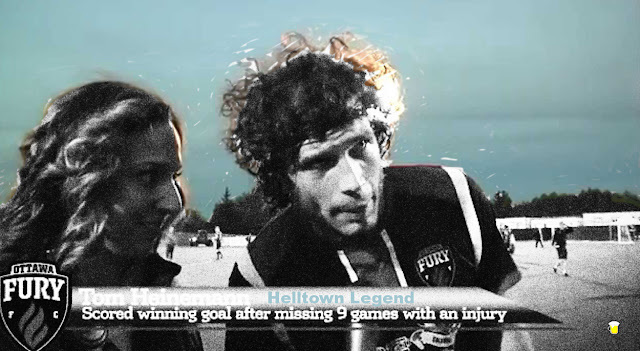 One of the players leading the way for them is a familiar face to Helltown in Tom Heinemann. After working through some injuries the last year he has helped take Ottawa to their remarkable record this Fall with 4 goals and 2 assists in 819 minutes. Top 15 NASL Goal + Assist p90 leaders with at least 450 minutes (5 games) played. Still a bit to go in the Fall Season for the NASL but that list provides the league leaders as things stand. Over the years I've noted that any player jumping up over 0.60 goals + assists is ready for the next level. We'll see if these guys can keep it going the remainder of the year. Heinemann is one we'll keep an eye on here. His story so far is a good one and wherever he goes he seems to bring a infectious amount of positivity, excitement and winning. Not surprising to me that he's on the best NASL club right now. Heinemann was great fun to follow here in Columbus. Not sure where this site would be without him or Eddie Gaven back in 2011. Ottawa is one of the most exciting teams in North America right now. You can find their matches on ESPN3 / Watch ESPN.